Cliff Avril was born April 8, 1986 and is a defensive end for the Seattle Seahawks of the National Football League. He was born in Jacksonville, Florida and attended Clay High School in Green Cove Springs. He was Second-team All-State selection as a defensive end his senior season, after recording 80 tackles, including 11-for-losses, nine sacks and four pass breakups. Avril was drafted in the third round (92nd overall) of the 2008 NFL Draft by the Detroit Lions. He signed a three-year, $1.634 million contract. In 2008 he recorded 23 tackles and five sacks. He was named to the Sporting News All-Rookie team. 2009 saw even better tackle statistics for Avril. He recorded 18 more tackles in 2009 than he did his rookie year in 2008. But his pass rushing ability was not much better than his rookie year as he recorded just a half sack more(5.5)in 2009. In 2010 Avril posted the best stats of his career with 33 tackles and 8.5 sacks. Not to be outdone by this, Avril played in all 16 games for the first time in 2011. He had 36 tackles, and a team-high 11 sacks. Avril had more forced fumbles than any other defensive end with 6. He also had 3 fumble recoveries (one for a touchdown) to go along with an interception that was returned for a touchdown. Many sportswriters felt that he was worthy of the Pro Bowl, but Jared Allen, Jason Pierre-Paul, and Jason Babin were selected instead to the NFC roster. On March 5, 2012, the Lions placed the non-exclusive franchise tag on Avril, keeping him in Detroit for the 2012 season. On August 5, Avril signed his tender, which was worth $10.6 million. Prior to the franchise tag, Avril rejected a 3-year, $30 million contract offered by the Lions. On March 13, 2013, Avril signed a two year, $13 million contract with the Seattle Seahawks. Football stars such as a Cliff Avril have taken the game to new heights by excelling at their respective position. 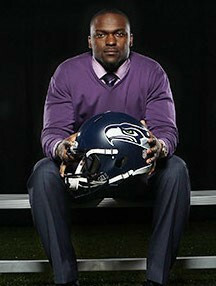 The booking agents at AthletePromotions can assist with Cliff Avril speaking engagements or appearances from NFL stars. We have years of experience in booking gridiron greats for keynote speeches and autograph signings. Hiring a football speaker like Cliff Avril is not a hard process. Our agents can provide availability, fees and all costs associated in bringing out a successful football star to your next corporate event. We can find Cliff Avrils agent to make this booking happen. A Cliff Avril appearance will add energy to your upcoming event and reward employees, customers and clients.Most likely, football fans and corporations can find Cliff Avril's official website, charity involvement, Twitter account, representation, publicist and management info at www.Cliff Avril.com.